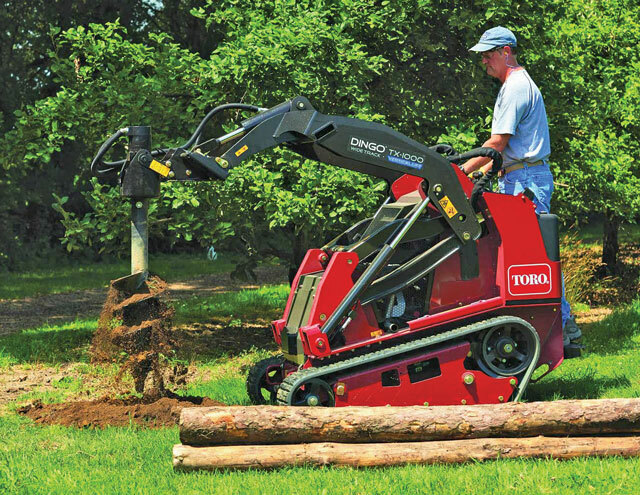 Compact tool carriers (sometimes termed compact skid steers, compact utility loaders or mini-track loaders) continue to evolve into machines of greater capacity and utility. For one thing, they are getting bigger, which seems to be the natural order of things for machinery, even if the trend seems counter intuitive for compact machinery. But these mini tool carriers also are growing more versatile as attachment-makers adapt their many tools to the mini-platform. These two marketing trends are having an impact on work habits, with a consequential shifting of sentiment among end-users about how they can best employ their compact tool carriers and tools. The Ditch Witch SK1550 is a good example of all this. It is the biggest mini skid steer in the Ditch Witch lineup, a 2-ton, 44-hp machine. Some full-size compact track loaders weigh just a ton more with only two or three additional horsepower under their hoods. Because of its powerful operating capacity, Thompson says one task growing in popularity among SK1550 operators is clearing land overgrown with bushes and trees. A hydraulic tree shear with more than 41,000 ft-lbs of press force that can slice through 7-in. tree trunks is one example. And the KS1550’s 16-gpm maximum hydraulic flow rate is more than enough for aftermarket brush cutters like the Brush Wolf 4200 — which is increasingly popular with mini skid steer operators. The SK1550 features low-, mid- and high-flow hydraulic options to optimize attachment versatility. Buckets are the staple attachment for most compact tool carrier end-users, of course. Nearly every compact tool carrier is mated to a bucket of one style or another. Beyond that standard choice, however, customers are attaching tools that facilitate whatever task they have before them. “I would say that once you get past buckets, there are five or six tools in the next tier of popularity, including augers and vibratory plows,” Thompson says. And trenchers, of course. “We are a trencher company at heart, and we’re proud of our trenchers,” Thompson cites. The Ditch Witch MT9 microtrencher, which requires at least 13-gpm of hydraulic flow and 37-hp, makes a nice fit with the SK1550. Thompson says the SK1550-MT9 combination is popular with contractors laying fiber-optic lines. The Ditch Witch organization manufactures a broad range of attachments for its mini skid steers so it can ensure compatibility and best performance. 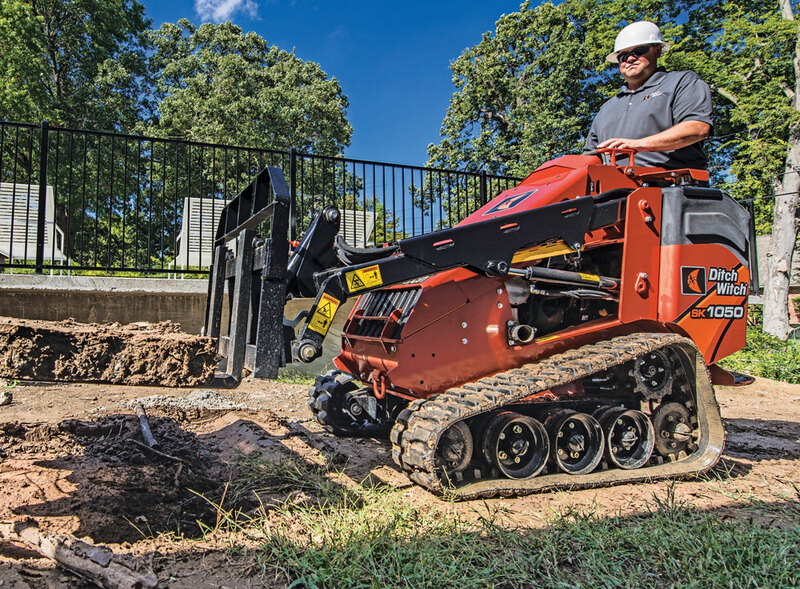 “We feel we know what it takes for an attachment to deliver quality work when attached to a Ditch Witch mini skid steer,” Thompson says. Among staple Bobcat attachments is the auger, according to Zima. Both the MT55 and MT85 mini track loaders will accommodate auger attachments, because each loader offers 25-hp engines and 12-gpm hydraulic flow rates. The primary distinction between the machines is lifting capacity: The MT85 offers 50 percent more lift and is heavier. Once again, the bigger the better. As Thompson says, there are many compact tool carrier attachment manufacturers in the United States and overseas — from A (ANBO Attachments) to at least T (Triple S Products) — which means there is ample choice of the engineered tools and competitive pricing for them. An example is Bobcat’s auger for the MT55 mini track loader. It can drill down about 5 ft and handle bits ranging from 6 to 48 in. in diameter. It also offers torque and speed options and runs a buyer about $1,300. If you prefer an aftermarket auger for your MT55 compact tool carrier (or a similar Toro, Ditch Witch or Vermeer model), one option is a Spartan Equipment X1500 that spins auger bits up to 36 in. in diameter. Cost: $2,150. Bobcat’s most expensive compact tool carrier attachment? Its backhoe, which is priced at $5,700. That is much less than the price of a dedicated backhoe, but a lot more than an entire tool shed of shovels. This is where contractors have to compute the ROI on an attachment to determine if it is a sound investment. Attaching tools speedily and easily is almost a Bobcat trademark. The quick-attachment system called Bob-Tach was introduced 35 years ago. Today the company offers both that proprietary attachment system and the common industry interface to ensure Bobcat mini track loaders can accommodate assorted aftermarket tools. In the past, contractors bought a ride-on machine when they determined a tool carrier could accomplish a task more efficiently and cost-effectively than if the job were undertaken with manual labor. Now as the tools grow more sophisticated and compact tool carriers grow more powerful, owner-operators are having to rethink the whole premise. It no longer is just about supplanting manual labor. Compact tool carrier owners are seeing their vistas expand beyond the original rationale for buying the versatile little tool carriers and their many tools. 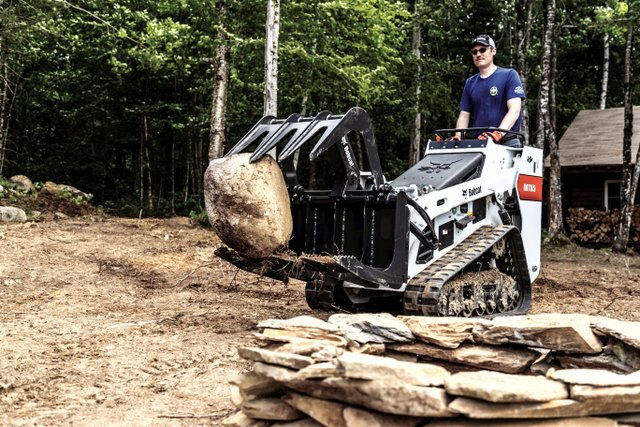 Contractors can further customize their mini skid steer loader with either 7-in.-wide tracks that produce 5 psi of ground pressure or 9-in.-wide tracks with 4 psi of ground pressure. Late last year, Vermeer expanded its compact equipment lineup with the new S925TX mini skid steer, designed to provide impressive lifting performance and the power to conquer the most demanding applications. With a tip capacity of 2,643 lbs, a rated operating capacity of 925 lbs and maximum hinge pin height reach of 84.5 in., the radial-lift path of the Vermeer S925TX makes easy work of lifting and dumping heavy loads. The new mini skid steer features a dual auxiliary system which allows the operator to switch between high flow for ground-engaging attachments and low flow for maximum control. It is also equipped with a universal mounting plate that fits a broad range of attachments. The new Vermeer S925TX mini skid steer is offered in three smooth-running, high-torque, four-cylinder engine options, including a 24.8-hp Kubota V1505 diesel engine, a 40-hp Kubota WG1605 gas engine and the 35.1-hp Kubota V1505 diesel engine offered only for international markets. 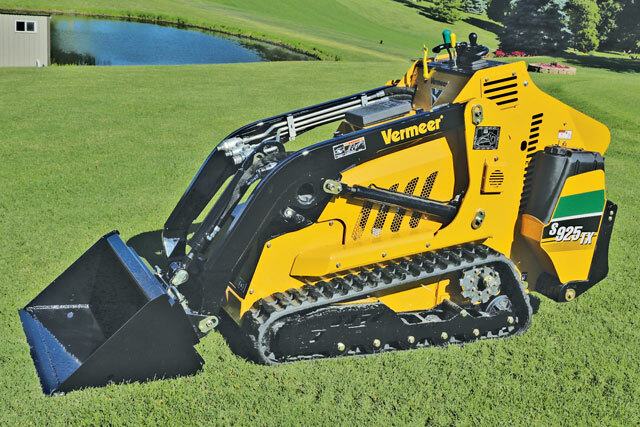 For more info, visit vermeer.com. Read more about compact tool carrier attachments here.